The fans pick: Good. NNY's voice of reason. Prevents Bad things. Do you wish Nny and Devi woulda' started dating? The fans pick: Yess, the woulda' made a cute couple! Do you no who Mmy is? The fans pick: YES OF COURSE HE IS SO FREAKIN HOT!!!!!!!!!!!!!!!!!!! This is a wierd pergunta but, do you think Nny is cute for a cartoon comic guy? Just wonderin'. 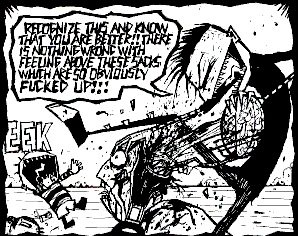 Ok...ive got ALL the JtHM comics on my computer, so do you guys want me to post them all here? gaz: on the third dia of natal my WORST friend gave to me, 3 gaaaAAmeboys! dib: on the fourth dia of natal my best friend gave to me! 4 ways to get zim! Johnny trotted around his house for a few minutos for no apparent reason when he came across a little girl sleeping on his living room floor. she had long, silky Black hair and a little old white dress. "who are you?" he demanded. frightened, she woke up and sat up. she shook her head as she tried to wake up but said nothing. she seemed to scared to say a word, as if she had no idea what she was doing here. "what are you doing here, little girl?" Johnny asked slowly with a creepy grin. she blinked. Johnny was not appeased. how many spikes does nny have on his boots?